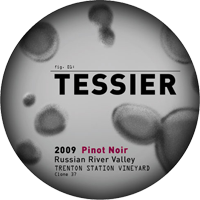 Kristie Tacey, winemaker and founder of Tessier Winery, started out in the research science field studying protein pathways at the University of Michigan Medical Center. She migrated to the San Francisco Bay Area to pursue a career in biotechnology. In 2000, she worked on the Human Genome Project and later focused on central nervous system diseases. She was published several times in her field. It was around this time that she was introduced to the world of wine and winemaking. Discovering what she saw as the perfect blend of science and artistry, Kristie knew she’d found her true calling, and jumped into the field with both feet. After working for a while at an award-winning East Bay winery as Operations Manager and Assistant Winemaker, Kristie started Tessier Winery in 2009, where she now focuses on small-batch, artisan Pinot Noir, Grenache and Viognier. The Russian River Valley American Viticultural Area (AVA) is located in the heart of Sonoma County, California, just fifty-five miles north of San Francisco. The seasonal fog and the tempering effects of the ocean to our west give us an uncommonly long growing season, and creates ideal conditions for cool-climate-loving grape varieties, particularly Chardonnay and Pinot Noir. These nearly ideal growing conditions result in wines of uncommon depth and richness that still maintain their bright natural acidity. Russian River Valley is not only abundant with grape growing and winemaking; it is also rich in history—both geological and man-made. This history makes the Russian River Valley a special place to grow grapes, to make wine, to live or to visit.